What do a root beer float, a pint of beer and a cup of hot tea have in common? In this case it's that they are all served in wooden glasses - glasses that are designed to hold water and be unaffected by it and not to impart any off taste to what they contain. The secret to this is to impregnate the pores of the wood with an epoxy resin, such as the ones described at the end of this article. Here I will explain my process for doing this and for finishing the vessels. 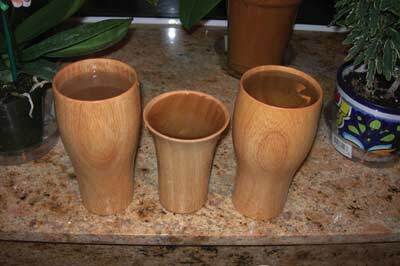 To me the ideal wood for drinking glasses would be sugar maple (Acer saccharum). But why this particular timber? Because we consume the sap of this tree in the form of maple syrup. Therefore, it seems reasonable that the wood itself should be one of the safest to use. However, almost any wood can be used with the exception of known poisonous woods and oily woods like cocobolo (Dalbergia retusa). Here, I have used ash (Fraxinus americana) as it is well known and readily available. However, I have made wooden glasses from olive (Olea bocstetteri) redwood, redwood burl, (Sequoia sempervirens) black acacia (Terminalia ivorensis) and red gum (Eucalyptus camaldulensis). Epoxy resins come in many types intended for different purposes: as adhesives, potting or encapsulation resins, surface coatings, for boat building, fibre glassing, to repair rotten wood etc. The type I look for has the characteristics of being clear, cures to a hard state, cures slowly and has a low viscosity. The one I use is in the class of resin systems used for filament winding. These resin systems must have a long enough pot life so they can be used all day long without increasing in viscosity to the extent of being unusable. The epoxy I use is from Rhino Linings (www.rhinoliningsuk.co.uk). I use their 1403 epoxy resin cured with their 403 curing agent. This is mixed 2/1 by volume or 100/43 by weight. It has a gel time of about eight hours at 20°C. However, for this application, a resin system with a gel time of 1-2 hours at 20°C would be a better choice. I would suggest avoiding resin systems with gel times of 15 to 30 minutes as they cure too fast for convenient use and they also may contain volatile curing agent materials. 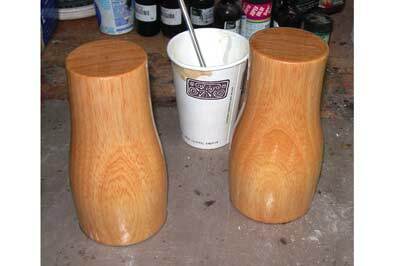 There are two methods I use to seal the wood with epoxy resins. 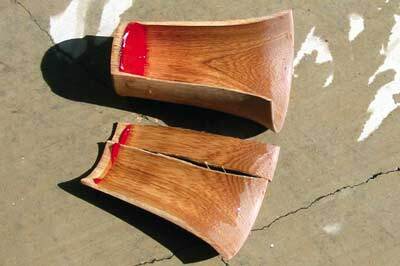 The first and simplest method is to dilute the epoxy with a solvent. 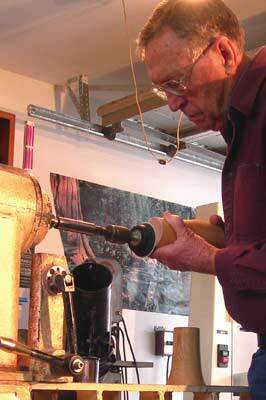 The second and more complex method is to use a vacuum to get better impregnation of the epoxy into the wood. Both methods will seal the wood and therefore I have used both methods within this article. I used vacuum impregnation on the teacup and added acetone to the same epoxy mix before coating and sealing the two glasses. After I'd turned and sanded the teacup to 320 grit, it weighed 72 grams. It and the two glasses were put into a warm oven, 125°F, so that when coated with the epoxy resin the warm wood would reduce the viscosity of the epoxy, which would aid penetration. When the teacup was warm, it was coated with the epoxy resin and placed into a vacuum vessel and the vessel evacuated to pressure of about -20 to -26 inch of Hg. As the pressure is reduced, you can see the air bubbling from the wood and the surface looks like it is coated with a thin layer of white foam. As the pressure is further reduced, the bubbles in the foam break and the coating becomes clear. I then brought the vessel back to atmospheric pressure. This higher pressure forces resin deeper into the pores of the wood. You will see 'dry spots' where the resin has penetrated the wood (mostly end grain). These spots were recoated and the cup returned to the vacuum vessel for another cycle. 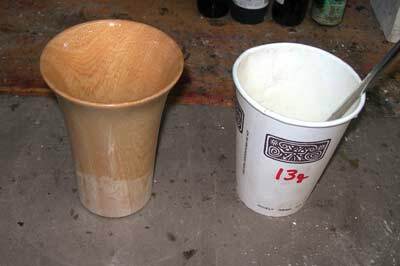 After two cycles the cup was wiped with paper towels to remove all the resin on the surfaces. It was then placed on a sheet of waxed paper to cure. If you don't have vacuum capabilities then reducing the viscosity of the epoxy resin with solvent is another method of sealing the wood. After the teacup was coated, the epoxy resin was diluted with acetone, about 10 per cent, and then it was used to coat the two glasses. Some of the diluted resin was poured into each glass and rolled around to coat the surfaces at the bottom of each glass and an acid brush was used to spread the coating over the rest of the surfaces. When I turned the glasses over, I could see the resin weeping through the bottom of the glasses. The outside bottom was coated and allowed to set until dry spots appeared. These were recoated several times and then all the surface resin wiped off the entire glass. The two glasses were also placed on waxed paper to cure. The way I turned these items was to drill out most of the wood with a 50mm (2in) diameter Forstner bit. This gives a flat bottom on the inside but leaves a rough surface. To add a 'wow' factor and to cover up the rough bottom of the piece, I added a 1-2mm thick layer of red epoxy to the inside of each item at this time. I mixed a new batch of epoxy resin and added some of Inlace's red dye. Because I poured the red epoxy into the items before the epoxy had cured, some of the red colour bled through the bottoms and appeared on the outside. To avoid this, let the epoxy cure before adding any coloured epoxy to the bottom. The temperature in my shop during this process was cool, 50-60°F; therefore the cure time was going to be long and I left the items to cure for about 36 hours before I put them in a cold oven and turned the temperature to 125°F for an overnight post cure. 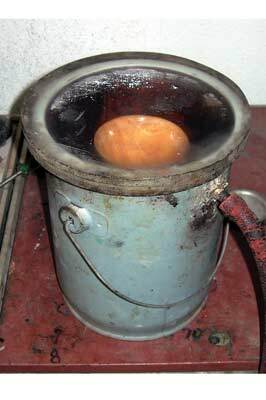 Why the post-cure at an elevated temperature? Epoxy resins cure by a chemical reaction. 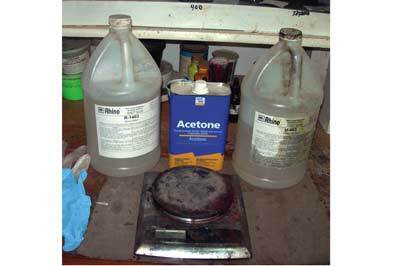 The component chemicals - part A and part B - are mixed and the reaction starts. As the reaction continues, the viscosity increases and finally the system gels; that is, it will no longer flow, and becomes a soft solid. As the reaction continues the solid becomes harder and the reaction slows down and will eventually stop. Increasing the temperature restarts the reaction and pushes the state of cure to a much higher state, or maybe to a complete cure. For example, a post cure at an elevated temperature will increase the hardness or stiffness of a cured resin when measured at a higher temperature. After the post cure the items were sanded inside and out with 400 grit and buffed on the outside with red diamond buffing compound. Since these are utility items, a higher polish is not necessary and will not last when in use. The inside surface consists of mostly exposed wood with some epoxy. The teacup, vacuum impregnated, gained 11 per cent in weight while the two glasses, solvent impregnated, gained 7.3 and 8.2 per cent respectively. 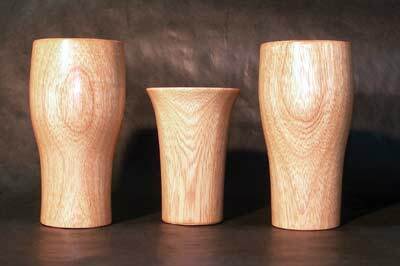 As these are drinking vessels and will be filled with liquids, it makes sense to fill them with water and extract any undesirable materials from the wood and epoxy before they are put into service. Therefore all three items were filled with warm water and set aside to soak for a few hours. The water was replaced for a second soaking for several more hours, replaced a third time and the vessels soaked overnight. Total soak time was about 20 hours. After the overnight soaking, one of the glasses had a slight leak. It was put into the 125°F oven, dried, recoated and re-soaked. This fixed the leak. Because the teacup will be used to make hot tea, the surface layer needs to be extracted with boiling water before use. Therefore, water was boiled and poured into the cup to set for 30 minutes, and the process repeated once before tea was made and drunk from the cup. As these are utility items, it seems probable that at some point someone will put one of them in a dishwasher or a microwave. Why not see what will happen? Using the teacup, I decided to see if it would hold up. Would it catch fire? Split? Break? First I put it in our dishwasher and ran the normal wash and dry cycles. After this treatment, the top of the cup was noticeably distorted. 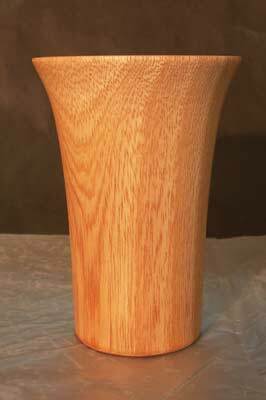 The diameter measured with the grain was 100mm (4in) and across the grain 92mm (3 2/3in). The finish on the outside was noticeably duller. 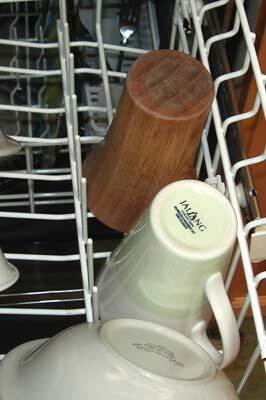 Clearly this was not good for the wooden cup, but neither was it catastrophic. Next, I tried the microwave. The cup holds about 350ml when completely full. It was filled with 275ml cold water and placed into our 1100W microwave oven with a turntable and heated at full power until the water boiled. 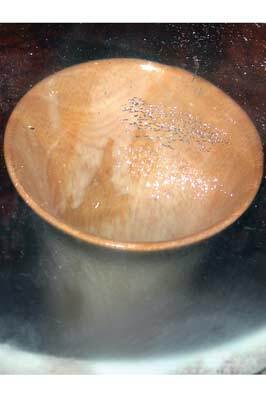 The wooden cup did not catch fire nor did it seem to be damaged in any way. Again, I don't recommend you doing this to your turnings. We all know from experience that if we drop a glass or ceramic cup filled with water onto a cement floor, the cup will break. 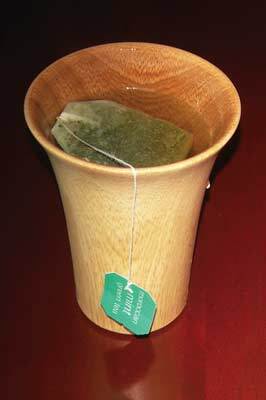 What about our wooden cup? I filled the cup with 275ml of water and pushed it off a tabletop. The water spilled out but the about dropping it straight down from 6ft so it lands on its bottom and the full weight of the water is transferred through the cup to the cement? Well, that was too much for this cup as it split into three pieces and was destroyed. But the splitting gives us a good look at the cross section of the cup and how uniform the wall was. The greatest thickness was 4.5mm and occurred where one would be holding the cup, and the smallest was 2.5mm at the bottom. The wood at the bottom was 6mm (1/4in) thick and the epoxy was 2mm. 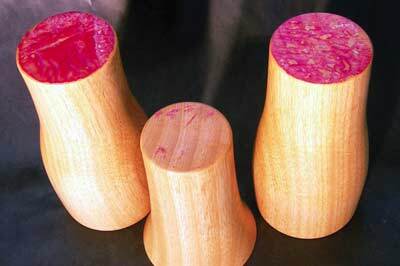 The latter test may qualify wooden beer glasses to meet the UK standards for shatterproof beer glasses. 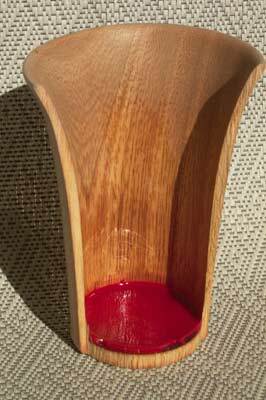 Within this article I have tried to show that modern wooden items can be produced that are very water resistant, and therefore utilitarian by simply impregnating the wood pores with an epoxy resin. The techniques presented here can also be used on other wooden pieces that are more artistic in nature and will provide greater protection of the wood than most other coating systems.